Hell, it's about time. Ever since we gave you that first peek into NVIDIA's upcoming portable gaming console back in January, we've been waiting for an official shipping day, and it appears that we finally have one! Release date, initially pegged at June 25, was missed due to delays and we were only told that the portable will ship by the end of July. This ambiguity has been resolved, for a listing on GameStop by NVIDIA has now set the date to July 25, or 3 days from now. This comes despite an official memo on the NVIDIA site claiming that Shield will start shipping on July 31. The latter is the one we're more inclined to trust. The price, as we told you a while ago, has been reconsidered and the initial tag of $349 has dropped down to a more appealing $299. The console will only be available to those living in the US, for now. 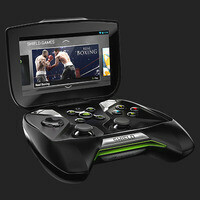 As a refresher, the NVIDIA Shield comes packing heat, with a 1.9GHz Tegra 4 quad-core processor aided by 2GB of RAM. The display is a 5-inch 720p 'retinal quality' panel, whatever that means. In terms of storage, you're getting 16GB, expandable via a microSD card. Running the show is Android Jelly Bean, although the exact iteration is unspecified. In terms of connectivity, the device comes with a dual band MIMO Wi-Fi antenna for better performance, a Bluetooth 3.0 and GPS. A complete specs sheet is available in the gallery below. Pickled your interest, but not quite ready to make the purchase? Perhaps this will help – NVIDIA is launching a (beta) feature that will allow you to stream PC games from your computer to Shield. Of course, there's a catch – support for titles is limited, and only desktops running NVDIA's latest GPUs – GTX650 or higher – will be able to take advantage of this otherwise compelling feature. $299 lol. You can buy a Wii-U for $299. And that comes with a console AND a tablet controller. You can buy a PS4 for $399. exactly the point i was going to make; well said. The price alone will make it flop. Ha could get a vita an DS for that price. Wtf where they thinking. Knowing next gen consoles come out in 4 months. I'll keep my phone and play free games. It's just a slightly bigger gs3. Without the features. The launch price should not be more than $199. PS Vita flop because of their high launch price Sony did bring it down to $199 but its too little too late.